The filer alleges that a software update enabled two factor authentication on or around September 2015. 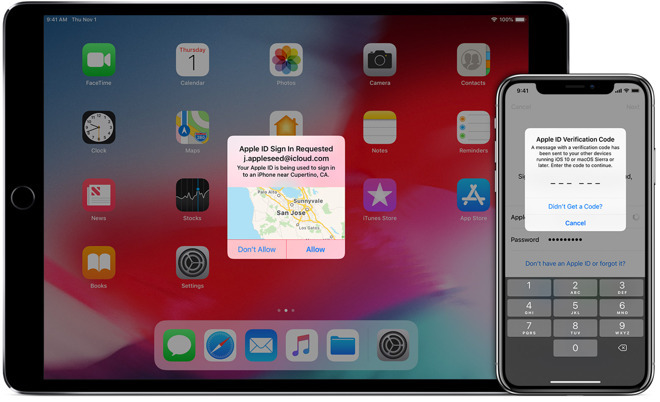 However, neither macOS El Capitan nor iOS 9 released in the timeframe put forth by the filer mandated two-factor authentication, nor implemented it without an explicit and multiple-step opt-in procedure requiring the user to consent. It is required to take advantage of some of Apple's services, like Home Sharing and HomeKit Hubs, however. This is so frivolous. If the person who brought forth this case loses they should have to pay any and all Apple legal fees. I would agree with the lawsuit. The two factor authentication process is time consuming and inconvenient for the users. Apple should work on another way to strengthen security. What happened to simple and intuitive philosophy of Apple’s? What do you propose is a better safe and secure way to secure your account and prevent someone easily resetting your password and accessing your persons information? What other company does it better while just as secure? Yeah, I can see where 22 seconds periodically would be a major drag on your day. I traveled through Beijing a few years back, and maybe coincidentally a few days later I had a two factor authentication request from Guangzhou. They had my password, and fortunately I stopped them with the second factor. I for one find their method to be valuable and the right level of intrusiveness in the workflow. For one, they could get rid of the ridiculous in-security questions, which defeat the purpose of any real security they implement. It's hard to take anyone who uses those seriously. I suppose a properly implemented 2FA is better than not, in terms of security. But, like many things, it's a tradeoff. I'm going to sue Apple for requiring my password to be too long. It's a major inconvenience on my life that I have to type a longer password than I want, even though I want a password, making it take an infinitesimally longer than it would if I had a smaller password! I think something else occurred to spark the lawsuit. See my other looong post. As much as my story says that 2FA on Apple is good, I agree with your points. You need something that you can control all the time. Even using email, SMS etc is a good next step, but they can be compromised too. See a story of recent years about people stealing millions in bitcoin by convincing AT&T that they should transfer his phone number to a new phone. And in that case I can agree that AT&T didn't want to be signed up to be the second factor. So while agreed that we need a better way, this method moves the bar above guessing passwords, and that is a good thing. He is right, its very cumbersome, bordering on harassment. I often have to run stairs up and down to be able to do what I could do with a simple mouse click. Its also very inconvenient when using another account. "Furthermore, once enabled, two-factor authentication "imposes an extraneous logging in procedure that requires a user to both remember password; and have access to a trusted device or trusted phone number" when a device is enabled." So two-factor authentication is bad because it requires two factors? I think I'll sue AI because I have to enter a password to login to my password-protected account to comment on this site. I demand 100% secure zero-factor authentication! Then I should probably sue them for popping up such a dialog box all the time that actually does waste my time trying to make it go away, or entering it.... because of THEIR incompetence. But, if we start down that road, Apple will be broke and I'll be rich. Hey, that doesn't sound so bad. Where's my phone and who knows a good lawyer? Exactly! It might raise the security a bit, but it also raises the possibility of something going really wrong, a lot. Also, another moral of the story is not to use Keychain to manage your passwords!!! Personally I’d rather be marginally “inconvenienced” and not have my accounts hacked. I really don’t know what the world is coming to when people are so put out by taking a few moments out of their day. Society is becoming so lazy. To my mind it’s the microwave ready meal types that this affects most. For anyone fully entrenched in the Apple ecosystem, especially those with newer and up to date devices, 2 factor is a very simple and streamlined process, especially considering how infrequently one needs to go through it. But even for those that may only have a couple of devices it still takes little to no time at all. I have 2FA go to all of my active Apple devices, Mac, iPad, iPhone, and I have an old iPhone and iPad, which are active via WiFi. All of these issues can be ameliorated, with a little planning. Unfortunately most people don’t realize what’s needed until too late, and Apple doesn’t do a lot to educate people when prompting hem to turn it on.